Elisabeth lived a happy and secure life until one horrible evening. Elisabeth and her parents were traveling by carriage when they were stopped by criminals. Her parents were murdered before her eyes and Elisabeth was sold to a brothel. Branded like cattle, Elisabeth had no choice but to await her fate. She found protection under the wings of Mary, a prostitute who had no hopes of ever leaving the brothel. Mary saved her when men came into the brothel by switching rooms. It's in this room Elisabeth meets Bryson. Bryson lives under the strict rules of his father. He is nineteen when his father decides it is time to lose his virginity. Bryson is unconscious when he's dragged into the brothel. When he wakes up he sees Elisabeth. Bryson can see that she is still very young. When Elisabeth begs him to help her escape he can't refuse. Together they flee the brothel and Bryson helps Elisabeth to get to safety. Bryson's father has a very bad reputation. Bryson is actually relieved when he hears that his father drowned in a shallow pool. He wastes no time and sells or burns every item that reminds him of his former life. Bryson's mother is relocated to live the rest of her days in Spain so Bryson can do whatever it takes to build a life for himself. He made sure he is well educated and he also took care of his brother. Bryson wants nothing more than restore his family name and to find a suitable wife. Elisabeth has never forgotten the young man who once saved her life. She still lives with her aunt and has never shown much interest in finding a husband. Elisabeth has secretly been waiting for the man she can't forget, Bryson. She now fills her days with work for her charity. Elisabeth saves young girls from brothels, so she can give them the life they deserve. All of the girls get an education, medical attention and they learn how to become a part of society again. Elisabeth even makes sure that they have a job before they leave her. After fifteen years Bryson and Elisabeth meet again at a dinner party. Bryson is a very honorable man. This shows in everything he does. He's good for his staff, kind to others and he also gives a lot of his fortune to charities. I liked Bryson a lot and thought he'd deserve a good wife like Elisabeth. Bryson has gone through so much and he has worked hard to get where he is today. He never complains and I admired that a lot in him. Elisabeth is a smart young woman. Even after what happened to her she hasn't lost her spark. I loved the way she bounces back. She has such a big heart and she truly is a kind person. I was cheering for both of them to finally find happiness and to be free of all the negativity that comes with a rough past. Charis Michaels wrote an emotional historical romance. Even though there were some rough issues in this story they were told with taste and dignity. 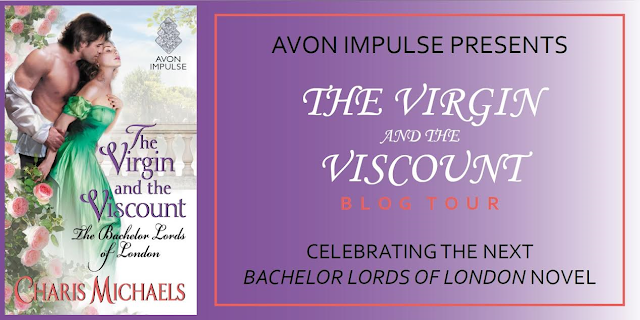 The Virgin and the Viscount is a refreshing love story that will keep you glued to the pages. If you believe in true love and finding your soul mate then you should absolutely read Bryson and Elisabeth's story. Three winners from the US will receive a paperback of Charis Michaels' first book The Earl Next Door. Good Luck! Thank you so much for this lovely feature and review! Oh dear, not my cup of tea at all but sounds absolutely perfect if you're into this genre. Best of luck with your début, Charis & here's to many more! How exciting it must be for you! To bad this is US only, I adore historicals and woud loe to read it. Awesome! Thanks for sharing your contest!